Although ceramics have been known to mankind literally for millennia, research has never ceased. Apart from the classic uses as a bulk material in pottery, construction, and decoration, the latter half of the twentieth century saw an explosive growth of application fields, such as electrical and thermal insulators, wear-resistant bearings, surface coatings, lightweight armour, or aerospace materials. In addition to plain, hard solids, modern ceramics come in many new guises such as fabrics, ultrathin films, microstructures and hybrid composites. 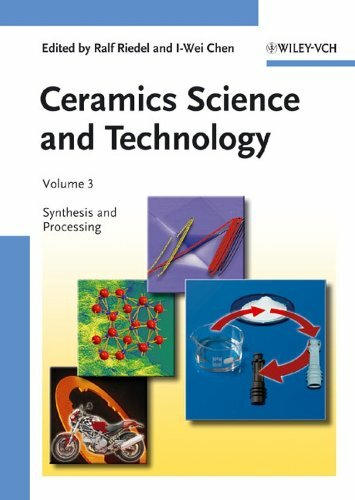 Built on the solid foundations laid down by the 20-volume series Materials Science and Technology, Ceramics Science and Technology picks out this exciting material class and illuminates it from all sides. Materials scientists, engineers, chemists, biochemists, physicists and medical researchers alike will find this work a treasure trove for a wide range of ceramics knowledge from theory and fundamentals to practical approaches and problem solutions. Prof. Riedel has been Professor at the Institute of Materials Science at the Darmstadt University of Technology in Darmstadt since 1993. He received a Diploma degree in chemistry in 1984 and he finished his dissertation in Inorganic Chemistry in 1986 at the University of Stuttgart. After postdoctoral research at the Max-Planck-Institute for Metals Research and the Institute of Inorganic Chemistry at the University of Stuttgart he completed his habilitation in the field of Inorganic Chemistry in 1992. Prof. Riedel is Fellow of the American Ceramic Society and was awarded with the Dionyz Stur Gold Medal for merits in natural sciences. He is a member of the World Academy of Ceramics and Guest Professor at the Jiangsu University in Zhenjiang, China. In 2006 he received an honorary doctorate from the Slovak Academy of Sciences, Bratislava, Slovakia. In 2009 he was awarded with an honorary professorship at the Tianjin University in China. He published more than 300 papers and patents and he is widely known for his research in the field of polymer derived ceramics and on ultra high pressure synthesis of new materials. I-Wei Chen is currently Skirkanich Professor of Materials Innovation at the University of Pennsylvania since 1997, where he also gained his master's degree in 1975. He received his bachelor's degree in physics from Tsinghua University, Taiwan, in 1972, and earned his doctorate in metallurgy from the Massachusetts Institute of Technology in 1980. He taught at the University of Michigan (Materials) during 1986-1997 and MIT (Nuclear Engineering; Materials) during 1980-1986. He began ceramic research studying martensitic transformations in zirconia nano crystals, which led to work on transformation plasticity, superplasticity, fatigue, grain growth and sintering in various oxides and nitrides. He is currently interested in nanotechnology of ferroelectrics, thin film memory devices, and nano particles for biomedical applications. A Fellow of American Ceramic Society (1991) and recipient of its Ross Coffin Purdy Award (1994), Edward C. Henry Award (1999) and Sosman Award (2006), he authored over 90 papers in the Journal of the American Ceramic Society (1986-2006). He also received Humboldt Research Award for Senior U.S. Scientists (1997).